Our final episode has our wolf girl going toe-to-toe with Kyoya’s Mom—no, not the giant tanned lady, that’s Big Mama, who runs a nearby bar. 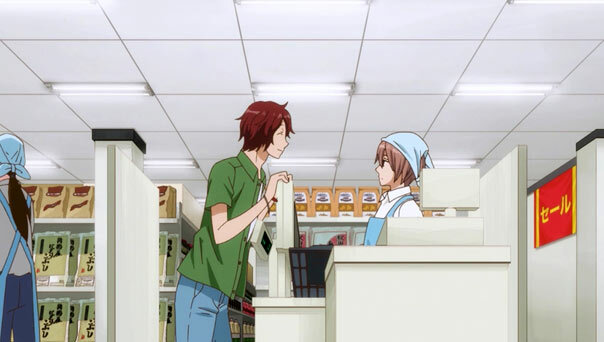 The mom turns out to be basically as Kyoya described: your typical normal middle-aged lady. But as nice and cute as she is, there’s a tinge of sadness to her, which has nothing to do with the fact she gets drunk and passes out on the first night Erika is there. No, Erika’s mom is not a drunk; but she does blame herself for Kyoya’s cold behavior and suspicion towards romance, a product of his parents separating due to various and ultimately mundane circumstances (bad luck, bad timing, what have you). Kyoya’s sis was old enough to accept it, but Kyoya dealt with the shock by closing his heart, which Erika was able to re-open, which led to his string of empty flings with women. Even Erika remembers the Kyoya who was more like Nozomi…but even Nozomi is reformed at this point, thanks to Erika (she’s just been all over the place maturing men, hasn’t she?) Case in point: an exceedingly cute exchange between Nozomi and Ayumi, who is so inoculated against his charms that when he asks her out to the fireworks she assumes he’s up to his old tricks and ignores him. Still, I think they’d make an intriguing couple. …Until we see her smirk and the wolf ears pop out. 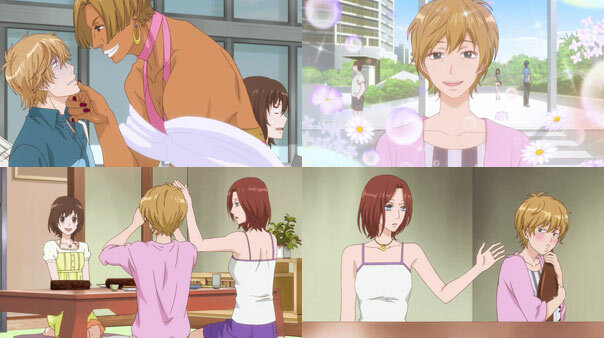 I like how she’s no afraid to use her ‘wolf girl abilites’; they may have been used for nefarious purposes in the past (like pretending Kyoya was her boyfriend to impress Marin and Aki in a desperate attempt to make friends with someone, anyone), but now she’s learned how useful they are for other purposes. Of course, when she’s on the phone using lies to get Kyoya’s mom to come to the festival, she pays a price for her ‘treachery’ when her necklace breaks. 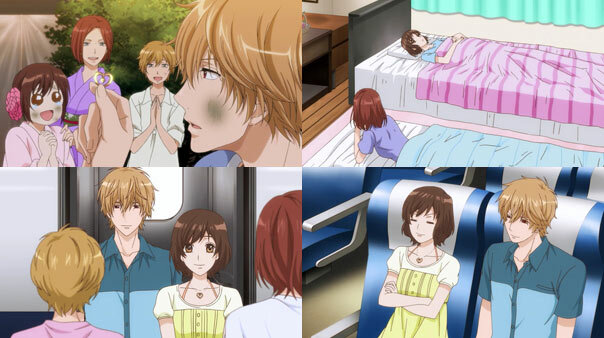 Kyoya, who came to ‘protect’ Erika in the first place (knowing full well how cute she was and the fact that guys would hit on her if she was alone), is predictably worried when Erika doesn’t return from the bathroom, and he searches the fairgrounds with increasing worry with Reika until their mom arrives and does something that, while embarrassing, is the most effective way to find their lost girl: yelling really loud. Kyoya finally overhears some put-off bystanders watching a filthy girl rustling through the garbage and discovers Erika. Reika tries to tell her it’s just an object; its the memories and emotions she still has that matter; Kyoya gets down on the ground and helps her search. Not only that, while mom is watching her not-emotionally-wounded-after-all son help his cute girlfriend, the fireworks start and light up the space between the dumpsters…where she spots the pendant. All’s well that ends well. 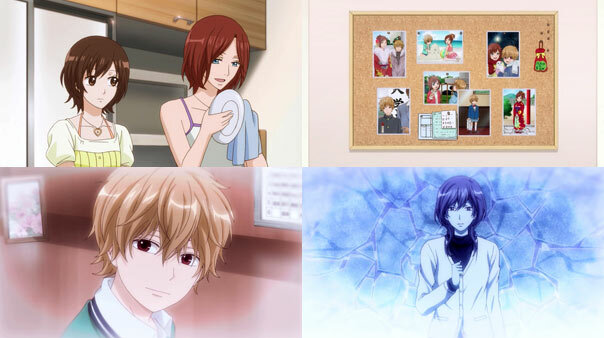 Kyoya thanks his mom and promises he’ll come to visit more; Reika apologizes to Erika for badmouthing Kyoya, and Erika gets some cute pictures of a young Kyoya having his snowman kicked over by Reika. Erika wants to make snowmen with Kyoya when it gets cold, and he considers if he should be the one doing the destroying this time. Erika is fine with that, but she’ll just build more snowmen, bigger and stronger! 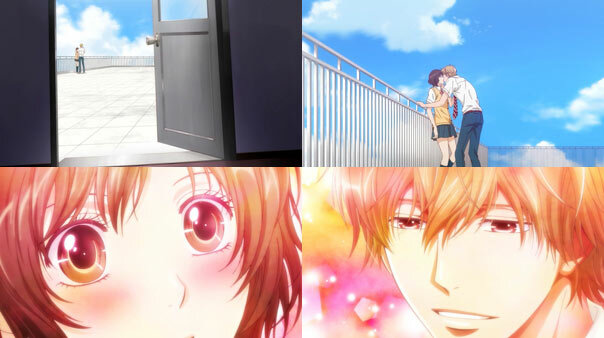 Erika tries to distribute those pictures to her friends, but is stopped and taken aside by Kyoya, who leads her to the roof deletes her pictures, and leans in for a kiss, telling her in his suavest voice that why worry about pics when the real things right in front of her? 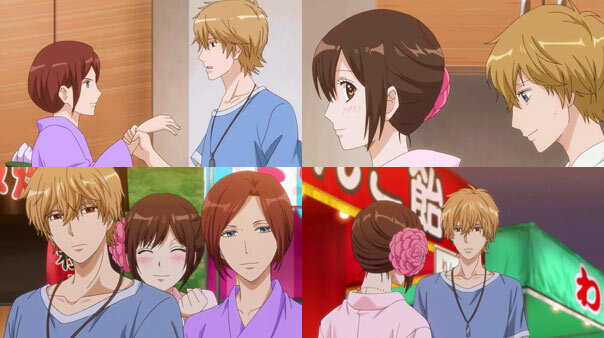 As Ayumi remarks to Nozomi, Erika and Kyoya sometimes have a funny way of communicating and expressing their love for each other outwardly, but it works for them. Just like this show worked for me! 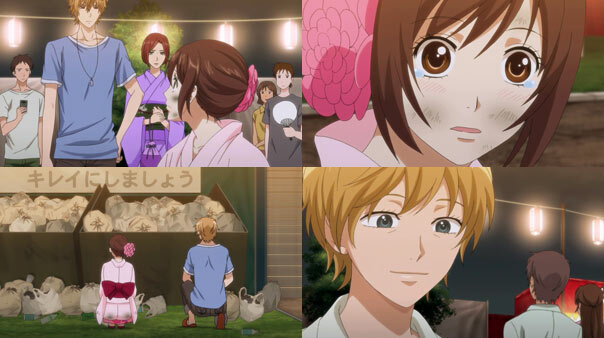 The reveal that Kyouya’s sister broke the snowman was perfect, as was the exchange about rebuilding them. This series certainly has come a long way. I’m glad I didn’t drop it after the first episode due to my desire to punch Kyouya.